Learn tips, tricks and techniques for your gardening! for inexpensive and easy DIY projects. In a previous article I outlined the steps in my procedure to propagate a Sandpaper Plant or Petrea Volubilis. In this article, I will discuss a technique to straighten the trunk of the Sandpaper Plant, sometimes called the Queen's Wreath or Purple Wreath. It is a technique that can be applied to correct not only the trunk but to a severely cured branch as well. Also, this technique may be used for all types of semi-woody to woody garden plants. As long as the garden plants are young enough, then the curve may be corrected. The photo below shows a young sandpaper vine with a bend in the trunk. In the photo, the trunk has skewed severely towards the left. This isn't extraordinary though, as branches of sandpaper vines have a tendency to behave this way. Branches of the sandpaper vine just typically move outwards from the vertical center. However, I'd prefer the Sandpaper Vine (Petrea Volubilis) to grow like a small tree and upright on its trunk like the photo in the previous article. There is a technique, called splinting, that will allow you to straighten a curved trunk or branch. This technique could also be used to straighten drooping, weak and broken branches like those mentioned in my article How to Apply Splints on Rangoon Creeper Marcots. 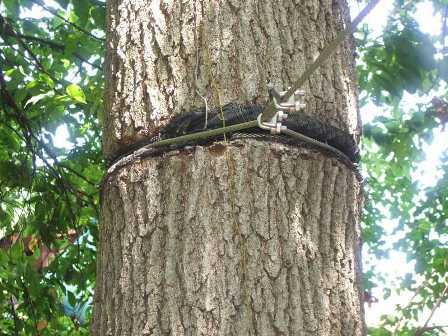 The technique calls for taping or tying a straight piece of rigid material (splint) to the curved branch or trunk. The curved branch or trunk is straightened to follow the contour of the splint or splint stake. The diagrom shows below how the splinting technique works. Before splinting, the young nursery bends or curves to the right. A rod, which acts as a single splint is attached to the left side of the trunk. The trunk is then contorted to follow the straightness of the stiff rod. Several side branches of the young nursery tree that get in the way were pruned. This is to facilitate the splinting process. Here's a single splint used on the right side of the trunk of a young sandpaper vine. The above photo and the diagram above it shows a single splint that was employed to straighten the trunk of a plant. If tape or any broad tying material was used then that would be fine. However, using wires or cords to tie the trunk to the rod may result in girdling. Girdling, also called ring barking or ring-barking is the complete removal of a strip of bark (consisting of cork cambium, phloem, cambium and sometimes going into the xylem) from around the entire circumference of either a branch or trunk of a woody plant. Girdling results in the death of the area above the girdle over time. A branch completely girdled will fail and when the main trunk of a tree is girdled, the entire tree will die, if it cannot regrow from above to bridge the wound. Here is a life-threatening result of girdling that happened to a tree. Aside from using tape, another way to prevent girdling is to use double splints. Go ahead, post your comment below!